As any business leader can tell you, it’s not always easy to have a smooth, productive business interaction with people from other cultures and there are invariably different customs and expectations to be aware of. In a tough business environment, then, how can we learn to compete and win on the world stage? One key, I’ve found, is to draw inspiration from the world of sports. Tip #1: Learn the rules of the game. Just like an athlete learns the playbook, you need to learn the rules for any situation you find yourself in. These rules differ widely across cultures. Take small talk, for example. In many cultures and especially those with more formal rules for communication and a strong emphasis on social hierarchy it’s taboo to make casual conversation with your boss. The same goes for performance feedback. In Germany, people are used to direct and concise feedback, without the positive ego-stroking that Americans find to be a critical part of the process. Think of notoriously direct New England Patriots coach Bill Belichick telling one of his receivers point-blank that he ran the wrong route during a playoff game. That’s how a German boss might provide feedback and how employees expect it but it’s very different from what Americans are used to in the workplace. So, Tip #1 is to learn the rules of the game. Tip #2: Dig into the details. It’s important to understand that not everyone from a given culture will necessarily act in the way you expect. Baseball players Albert Pujols and David Ortiz were both born in the Dominican Republic, but do they have the same personalities? Of course, not, and ultimately, that’s what you’ll find when doing business across cultures. People from the same country can differ in so many ways. For example: regional differences often matter a great deal . Take look at the differences dividing the Midwest and Northeast of the United States, southern and northern Italy, or the urban and rural areas of China. 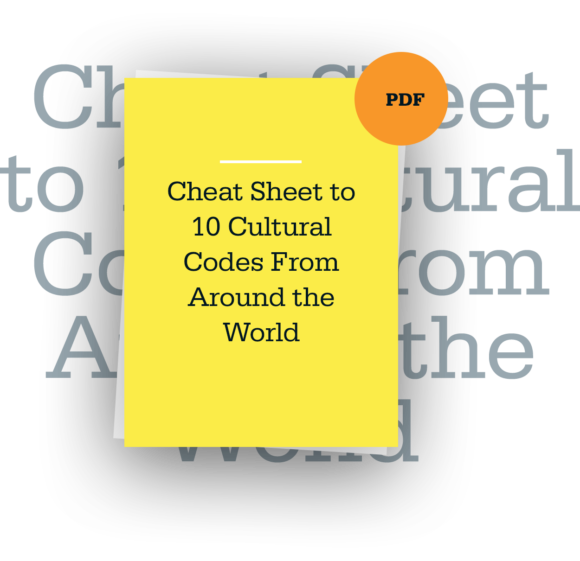 Corporate and industry cultures can also greatly affect the cultural code for a particular situation you face in your work abroad. In China, state-run enterprises tend to maintain more classically Chinese cultural norms that emphasize indirectness and modesty. And, of course, norms within a company vary tremendously and also have a substantial impact on the ways its employees have to customize their behavior. Lastly, the preferences and backgrounds of the particular people you interact with may change the cultural code in your situation. You may be in a culture that emphasizes assertiveness, but be interacting with people who are quite atypical. As a thought experiment, imagine trying to explain to someone how directly you are expected to communicate in the U.S. In very general terms, you might say that communication norms are quite direct compared with many other cultures, but does that hold in all cases? Would there be differences debating your case at a vigorous brainstorming session with investment bankers in downtown Manhattan, as opposed to a similar discussion with more mild-mannered colleagues at a small bank in central Illinois? Tip #3: Adjust your behavior. Finally, to be effective in a new culture, it’s vital to learn to adjust your behavior to the new norms while staying true to yourself. Houston Texan football coach Bill O’Brien might ask JJ Watt, a natural defensive player, to play offense on certain plays, because that’s what’s required in a particular situation. However, Watt can and should customize the way that he plays the position so that it’s natural and comfortable for him. He can’t try to adopt someone else’s approach — like that of one of the much smaller, shifty wide receivers on his team because it simply won’t work. The same goes when adapting to a foreign environment. Many of us will come face-to-face with colleagues of different cultural backgrounds, whether abroad or in our own offices. And just like athletes need physical dexterity — so too must business professionals strive for global dexterity. Learning to master this skill will help you become a stand out player on a global business stage. We all know the famous expression “When in Rome, act like the Romans.” But nowadays in global business, cultural adaptation isn’t often as simple as that.